Informed people know that someone with the character and methods of VP Binay will lead the Philippines once again down the path of corruption and perhaps even autocratic rule. The evidence of his crimes and lies is enormous. It is magnified by the disappearance of key witnesses, the independent Ombudsman’s charges against family members, and Binay’s failure to explain. But those who oppose Binay can’t get their message through to the broad laboring class and the poor because the audience holds stubbornly to its views. The laboring poor have listened to their neighbors and the barangay captain and mayor. Binay is their man. They’ve made up their minds. They defend their opinions against any logic or reason. Indeed, when one presents a different opinion on Binay, it just seems to harden their stand. Well, then, what can be done about that? It seems to me that the best approach is to avoid a direct confrontation, avoid a challenge. A challenge is taken as a personal attack that must be defended against. And that creates the hardening we observe. It is better to talk at an angle. That is, indirectly. Here are a few approaches that might be considered. He raises himself up, and lowers “them” down. It’s brilliant. But they can’t. They can only affirm the problem. It is a problem. Being sympathetic works so much better than trying to tell someone they are wrong. Or don’t get it. Or . . . yikes! . . . vote stupid. Compassion softens the heart and opens the mind. Angle Number 2: Use respected voices to convey the message. Now this might be the candidate himself, or it might be a celebrity or sports figure. Stars in the Philippines have authority. Credibility. Angle Number 3: Show that many are jumping off the Binay bandwagon. Schedule “Stop Binay” rallies in major cities across the nation. This is another form of testimony that those who advocate for Binay are on the outside looking in. They are out of step. It is an uncomfortable place to be. Angle Number 4: Promote the Philippines as a rising star in Asia and around the world. Every one loves to be on a winning team. Cite the reality that the Philippines is becoming a leader in Asia and around the world. Becoming the fastest growing nation in Asia. This is the path to success, more jobs and greater wealth. Cite the candidate’s commitment to stability rather than disruption, and honesty over cheating. It’s not the time to take risks, but to continue, steady on . . .
Let them draw the picture themselves. ← Is the Condonation Doctrine unconstitutional? Spurious surveys can really mislead people of all kinds in all kinds of the profession and can make rubbish of many intellectual analysis. Unless Pulse Asia and SWS surveys are proven trustworthy by any foreign surveys outfit I won’t waste time reading spin off opinion on their survey results. Imagine the extent survey lies foist on the people can generate. Condos and high rise buildings cost hundreds of millions to construct, what is a few millions give away in exchange for a few floors added to increase the floor area? What is several millions added to the total costs. The metaphor may be fallacious and unfair but that is the strength of corruption of morality of morals of the incorruptible organizations like the church, the Lions or Rotarians, even the Boy Scouts. Time will tell when this type of monkey business will and can be exposed. It is exposed. You have just stated it. The challenge is how to break it down. To me, it is a continuation of the kinds of pressures we have seen under President Aquino, upon the corrupt. It will be a slow, agonizing process, not unlike the effort to break down America’s ingrained racism. It can’t be done in 6 years or 20. But going backward can happen in one year. Why are the CDE class oblivious to Binay corruption? Because we made them so by not prosecuting the sins of the Marcoses – the original sinners when it comes to big time Philippine public corruption. Conversely, that failure to prosecute and punish (Madame Butterfly is still strutting around) is what gives oxygen of impunity on the behavior of the Binays. The bigger the corruption the bigger are the chances that they will actually get away with it. Plus, they will always have sycophants on the side like Tiangco or Estelito Mendoza to justify the kawalanghiyaan. And then there’s Danding Cojuangco who plundered the resources of the poor (coco funds) and gave it to the wealthy (himself). The masses are just, in effect, saying, better to have Robin Hood than Dooh Nibor. I learned today that we in the AB class are also susceptible to being gamed by the power brokers. The point was made that we are seeing a lot of Senator Marcos of late because there is a coordinated effort going on, involving media, to raise his image as a prospective leader of the Philippines. If you were a candidate, how would you propose speaking to the CDE community in a way that connects? I’ll put my money where my mouth is : I’ll give each one of them five thousand pesos (assuming funds are available, of course). Let’s look at it from the standpoint of a Roxas or a Poe, who are likely disinclined to break the law as you are, how would you suggest THEY speak to the CDE class? You are being a tad flippant, I think. I’m seriously interested in exploring the matter. I’m serious about the suggestion too Joe. I’m a little bit cynical you could talk moral sense on CDE voters’ perception of the Binays other than through their stomach. No need to be cynical. Just state that, because it is an important point that I may simply be too naive or ignorant to recognize. I don’t have all the answers, but I’d like to find some good ones. The blog is not a solution, but the start of a discussion aimed at a solution . . . if we are smart and candid enough. Increase the Conditional Cash Transfer amount. The candidates could indeed promise to do that. Good idea. The only currency that the CDE class recognize is CASH… Cash that can buy them food to last them a day or two plus an extra for a bottle of gin for the man of the house so he can boast of “more machoness”…. From “The Lessons of Jejomar”, who wrote the book about it. Being the son of a discredited (and hated) politician, I was expecting that he would just stay clear of politics. Maybe get a career as a doctor or, I don’t know, maybe as a teacher or something? But try to replicate the career of his father? I don’t quite understand that. Is he doing it to regain honor? Redemption? Or is it simply the arrogant assertion that his family’s crimes are not real? That his parents are beautiful innocent butterflies unjustly accused of stealing public money? In the Clash of Clans that is the Philippines, clans have values we might not subscribe to, but it holds them together. Marcos/Romualdez is one. My point, as it relates to the subject of the blog is that AB often is judgmental about the wrong-headedness of CDE for not seeing how their votes determine their well-being and ought not be sold for a bag of rice. Yet, AB is also manipulated and subject to the same awareness or knowledge limitations of CDE. And is equally adamant about their views. When the press speaks for the clans, we get distortions. Sadly that defines our major weakness as a people. However, I don’t think Marcos Jr. will have any chance of going as far as being President. If I am wrong, then we Filipinos are real time suckers and deserve to be fucked up. Or is Congresswoman Imelda, Governor Imee, and Senator Bongbong already a validation of our suckerhood? Marcos is, for being a national representative. The others reflect the clan’s hold on local politics. Delusions of grandeur, locally. It’s all pretty bizarre, for sure, as we see with Arroyo likely to run for re-election, and Binay holding favor. I don’t think Marcos will get any traction as a presidential candidate, no matter how much his mommy eggs him on. JoeAm with that question you just DIVED into the Amazon, the Yangtse, the Ganges, the Nile, the Danube, Rheine and Seine and the Thames and the Hudson or the Delaware. Just think of the variety, compass of the answers you will get. Thanks for not mentioning the Mississippi. My great great great grandfather drowned in it. True ‘nuf. I’d welcome ideas from everywhere as long as we get a solution out of it. Joe Am lazy me not to type the longest US river (3,730 kms) with the longest name Mississippi which has for a watershed or river basin almost two-thirds they say of America’ land mass. Rural America has progressed largely because of river basin development. Every seat of civilization has its river and lakes. Lawrence and Credit Rivers became the arteries of development for upper East Canada. Why the fetish for rivers from its headwaters to countless tributaries to their deltas? Tokyo has its Hayakawa (swift river), Big Apple its Hudson, London its Thames, etcetera. Manila has its almost unreclaimable polluted Pasig (25 kms only). From their rivers alone you can say a mouthful or book lengths of their peoples’ character. And theorized that less of the poor and largely of the rich the dirt and pollution of rivers accurately mirror the dirt and pollution of the politicians specially for compliant and obedient CDE Filipinos. Dirty and polluted rivers should tell a lot more about dirt and pollution of politicians who rule and control habitat and ecology. my observation why corrupt politicos have a good cde following is they are the conduit of the ‘trickle economics of gov’t big programs’ to their constituents in the form of vote buying, abuloy sa patay, gift giving during politico sponsored mass weddings, inter barangay basketball competitions, free birthday cakes, calamity doleouts, hospital payment contributions, budle-budle free meals, etc. the profits (the bukols and tongpats) of the politicos (or their dummies’ or cohorts’ or friends’) business interests which do business with the government are the resources they use to give out. i remember one politico debating me as saying “where will i get the monies to give to the poor except from government resources, my salary is not big enough and i am not rich, when they come knocking at my door to ask for food, i feed them or when a loved one is dead who needs to be burried or a loved one is hospitalized with exorbitant hospital bills, i help. gov’t offices take a lot of time to process them, they come to me for the quick relief to their problem.” but again, relief comes quickly only to the supporters, and if one is not a supporter…stay in line for the long wait. in binay’s case, he projects himself as proactive to the needs of the massa, and the massa also believes he has the resources to give even if they know that it comes from ill gotten wealth…to their mind “naambunan sila ng grasya”. it is thru this mechanism that the poor can immediately feel and touch undertakings of gov’t care for their wellbeing. the economic progress of the country is felt by the massa thru this method: political handouts and doleouts, and politcos take full advantage of it for the pa-epal effects of their effort. but most of these korakot politicos believe the 20/20/60=100 principle for ill gotten wealth…20% goes to the poor, 20% for the politco’s handlers, and 60% for the politico (the final analysis of which is that 100% is actually for the politicos benefit so the dynastic ambitions can be perpetuated) . what are the three basic needs of the poor? in my school of thought they are food, shelter and money (work). where will the food come from if many of our farms are converted into subdivisions? where will the landless massa find afordable dwelling places other than in river banks, esteros, catchbasins, or unoccupied lands privatley owned or government owned, these are centers of illegal and undocumented settler civilization (they squat to wait for government pabahay). where will they get money if they do not have work, no money no honey. what can the next president do for the massa to feel the impact of improving economy? i say it should be related to the three basic needs of the poor. affordable vertical mass housing for the poor will provide food, shelter and work. mass produced identical (at least 10 floors) buildings, (single design and architecture for uniformity of cost to combat overpricing and ease of construction) for massa pabahay (condomassa or massacondo). these condomassa buildings will have occupants from a mix of the ordinary laborers, teachers, policemen, gov’t clerks, the soldiers, nurses, tricycle driver (or any other good driver sweet lover), factory worker, domestics, street peddlers, mall salesperson, etc. they will reside in condomassa built in the proximity of their work areas at a low affordable rental (why not use the transportation cost to pay for the rental and use commute time for family bonding and thus ease traffic problems too). i forgot…to counter binay’s hold on the cde’s is his opposition should espouse a believable, doable program for the massa that are their real needs…food shelter and work and not freebies. Again, a very thought-provoking examination of the issue, and it feels very “right” from what I see around me (a lower income rice-growing area). I also very much like the vertical mass housing, if care is given to make sure they don’t turn into “projects” that foster crime, gangs, drug dealing and human trafficking. They must be attached to jobs. That is a huge subject good for a blog, I think. It also goes hand in hand with the national land use law I keep yapping about. Better overall planning for human and non-human resources of the Philippines. where there is an enclave of condomassa in the urban areas there is a school, a health center and a talipapa. in the provinces where farmers and fishermen are aplenty, where there is their enclave of condomassa, there is a school, a health clinic, a coop grocery, a product storage warehouse, and a cooperative mechanic shop to the care of their tractors, motors, and equipment. let their needs be in their immediate environs. and what a wonderful philippines this could be…it is a wonderful world. Messaging towards the CDE doesn’t appear to use a framework they can relate to. For the poor, the difference between a hundred thousand and half a billion is not readily comprehensible. What they do see are the “tangibles” via TV and : the big buildings, the Ospital ng Makati, and the good schools. They don’t realize that these probably cost a small fraction of the LGU’s revenues, that mysteriously went elsewhere. Erap would also point to the tangibles that had gone up during his terms as mayor. Roxas’ creation of jobs in BPO centers.. absolutely indispensable to keep a young labor force earning until other sectors can absorb them, but meaningless to those whose children could barely finish high school. How would you break through to the CDE community if you were a candidate opposing Binay? Sincerity. It has to shine through somehow. A kind of naturalness. Erap never promised to not be corrupt, but he promised to take care of people the way he did while mayor. And he sincerely believed he could and would do it, and so did the CDE. And the candidate has to be herself/himself. For all her prevarications, people see that in Poe. People definitely see it in Duterte. Roxas does have an image problem, but I daresay he’ll have more skilled image-builders next time. His camp was totally thrown for a loop by Binay’s sneak-up win. It was interesting to me to watch Roxas dealing with grieving Mamasapano families. He has a sincere touch that President Aquino does not, yet what gets projected through in the past was contrived. So I’d agree sincerity is important. The idea of coalitions is excellent. Western Visayas Governors have, on their own, started to set up such a coalition for Roxas. Roxas ought to have the contacts to get that done. I don’t know about Poe. Thing is, coalitions should rally around what is good governance–and then also for Roxas/Poe, or whichever candidates support that notion of governance. The new narrative should be that one person can’t embody and ensure good government all on their own. No more would-be sole saviors. It has to be systemic change, and by all classes, including the CDE themselves, supported by the candidate. I’d also get outstanding youth endorsers of good governance–those kids who’ve won at international scholastic and sports and talent competitions through grit and sustained work. And I’d get them now. As for artistas: no worry that the supply will run out. 🙂 Yes, I’d say there is a singing or movie or television star for every city with a few left over. Good thinking. I’m sure this will be read by the staff of the main candidates, so you’ve provided some good ideas. Especially that the endorsers should be speaking from a standard script of message points. If I am Roxas, and I don’t think any other candidate can do it, I will think of it this way. When it is asked how do you change CDE of the surveys no matter how inconclusive they have been portrayed in their opinions and political choices, what will be your premises? Indeed how? As a starting point you have the CDEs of more than a hundred other countries of the world. In general the CDEs of Asia or the Middle East vis-a- vis CDEs of Europe? Is it counterparting of Strata AB against Strata CDE? Of opposites of sufficiency or insufficiency of capability or power? Or of causation where AB behaviour causes CDE behaviour? Take the topnotcher countries in the UN Human Development Index. Spell out the variables on why there needs nothing to be done to the ABs and CDEs of Norway, Denmark, Britain, USA, Canada and Singapore when it comes to RATIONALITY of their choices of political leaders. In the Philippines what do you do with the mostly AB politicians? With the mostly CDE voters? Smart alecky commenters may say : No Sellers equals No buyers; no gift givers equals , no gift receivers; no bribe givers equals no bribe takers. In politics, he who buys and sells surveys, He who buys votes, he who sells votes MUST all go to jail in descending order of length of incarceration. Just common sense eh? Devoid of legal gobbledegooks. How then can COMELEC do that? If I am Roxas I will tell my President to tell the COMELEC the mechanics and process of deputizing the DILG, the PNP, all local government treasurers and if possible the Regional Trial Courts to insure clean elections and make reliance to the predictive results of the surveys a laughable joke. Browsing around yesterday, I saw one headline something like: “Why doesn’t COMELEC stop vote buying?” Of course, the answer from COMELEC is all kinds of runaround. But our conclusion must be, if COMELEC is tasked to produce legitimate elections, COMELEC is a failed institution. You ought to be one of the commissioners, I think. Answer : If I am Roxas, and I don’t think any other candidate can do it, I will think of it this way. Smart alecky commenters may say : No Sellers equals No buyers; no gift givers equals , no gift receivers; no bribe givers equals no bribe takers. In politics, he who buys and sells surveys, He who buys votes, he who sells votes MUST all go to jail in descending order of length of incarceration. Just common sense eh? Devoid of legal gobbledegooks. How then can COMELEC do that? If I am Roxas I will tell my President to tell the COMELEC the mechanics and action processes of deputizing the DILG, the PNP, the local government treasurers and if possible the Regional Trial Courts to insure clean elections and make belief or reliance to the predictive results of the surveys a laughable joke. Sorry for the repeat posting for the sake of putting the piece in context JoeAm. Angle Number 5 : Execute the David Cameron maneuver. David Cameron has just won a reelection last month. His strategy was to impose austerity measures early on his incumbent term which led to a lot of economic pain and suffering among the Brits, and then about 6 months before election, he relaxed his policy on austerity and the economy picked up a little bit. Government spending was increased. It’s like banging your head on the wall repeatedly. It feels good when you stop. The voters felt good when the austerity stopped. And they made him Prime Minister again. I don’t see how a candidate can employ that technique. He or she can promise anything, but can’t tangible do anything until elected. That could apply to administration candidate, presumably Roxas. Roxas’ boss could execute the Cameron maneuver. Life is austere enough as it is for the CDE. We don’t want to end up killing them. Yes, CDE is in dire straits for far too long already. Which means improving their economic lot will translate to administration votes on election time. What are elections afterall but a referendum largely on the economic performance of the incumbent administration. If it did well, administration candidate wins. Because President Aquino’s focus was on corruption, he lost sight of the need to pair it with substantive economic improvement on the lives of the poor to convince those folks it’s worth electing his manok. The Cameron maneuver is of course a rather underhanded method in trying to win an election but what was the cliche’ again, desperate times calls for desperate measures? Angle 1: I know, who the hell are you rich guy telling me that, will that help me? Angle 2: Coco Martin, OK, but I will still listen to Manny Pacquiao, BASTA! Angle 3: as long as my ka-basketball and kainuman are for Binay, Okey lang. Angle 4: e ano ip I am istil poor? Ip der is Binay, at list I can eat cake sometimes! Well, that still leaves us with the problem of how, indeed, to speak to the CDE class? Is the answer “it is impossible, Binay will be president”? I don’t think it is necessary to get all CDE votes to give up on Binay, but it would be nice to see his poll numbers go to 10% or less. When that hits the headlines, it will be another angle. 1) talk about what is being done now, such as CCT for poor children. 2) listen to them, what are their immediate problems – now. 3) tell them what will be done to solve them, soon. This takes a lot of sensitivity to their thinking and situation. Excellent advice, I think. Thanks. Thank you for reading, Jimmy. There’s an old saying that goes, “You can catch more flies with honey than with vinegar”. Although I think you’ll catch even more with crap. But seriously, I always cringe when people refer to Binay supporters as bobotantes. For the most part, they’re not. Some may be desperate, or misinformed, or shrewd, or pragmatic. But not stupid. And as you mentioned, challenging them, including by calling them bobotantes, only makes them dig in and defend their choice. Angle 1: You said this is what Binay is already doing. So it would take some major tweaking to come up with a version differentiated enough to cut through his message. Otherwise, you’re “me too” and it becomes a shouting match, a matter of who can make his or her message heard over the other. And let’s remember that the other party is not above accompanying their message with a little sweetener. Angle 2: Celebrity endorsers work. You just have to watch TV commercials to know that. But then it comes down to who gets the biggest celebrities to endorse your candidate. As Ireneo has stated, they already have Pacquiao. Angle 3: This sounds to me more like a tactical effort. Marketing people have something called a 360-degree approach to engaging the audience, meaning wherever the target turns or goes throughout the day, he will encounter something that delivers the message to him. This could be part of that. But you’ll still have to figure out the message. Angle 6: Here, first I must ask, is it really the CDE that need to be convinced? Because I think the Cs would be more or less employed and not as susceptible to patronage politics as the DEs. If this is the case, there might be a way to get to them yet. Also recently, Binay said he has a solid core of supporters of about 20 percent. If that’s true, then there’s a whopping 80 percent that are in play. So maybe, Angle 6 is to concentrate on that 80 percent instead. Angle 6. Depends on how many candidates there are. Indeed, Binay would be toast with a Roxas/Poe ticket, and only, say, Marcos to split the pie. Thanks for the shadings on the various angles. I’m back and should say that reading your blog still stirs my interest. Especially when the issue is about Binay and his supposed hold on the CDE classes. It’s still a long way to go till election May 2016 and everything can happen. Binay and his camp are still deluding themselves about a sure win through the CDE vote but I’d say he cannot and should not be so sure about an outcome that they only base on surveys. Where were those surveys taken? Did the answers from their questions on which to vote for came from people who have Internet and cable TV connections and are up to date about their knowledge of the latest accusations against Binay? The probable answer is: this is mind conditioning of the highest degree because people in almost all provinces, even in the remotest areas, now have connections to the Internet and cable TV so their knowledge of the latest news from Manila is much better and updated than the informal settlers in urban areas who are so busy eking out a living they do not have any time any more for issues that they do not care much about. Unless there is money to be paid for a day’s service to attend a rally for Binay or to hold a vigil to support his son..
Those phony surveys were randomly taken in such places, if they were really taken at all. Welcome back, Geng. It for sure would be a mistake to read the surveys so seriously, both for the time yet remaining and questions as to what they really mean and how they are constructed. A part of that particular problem is the way the tabloids headline them as if they were the final word. Reading the INquirer headlines, we would surmise that Binay is doing better than before, when I’d guess he is crashing and burning. Journalistic integrity ought to prevent those kinds of misleading conclusions, but hereabouts the method is to amplify them. How about filing a plunder case before the elections? Half of the CDE will think twice about voting a criminal. It would cramp his campaign sorties because he has to engage and attend to the Ombudsman or Sandiganbayan. I’m thinking those kinds of events will indeed occur. The Ombudsman is independent, however, and so we don’t know what the schedule might be. Corruption is a middle class issue. It will not be appreciated by the CDE class. What can get the CDE class is the “kababayan effect” as currently pursued by Duterte. I was talking to a taxi driver and he said that he is for Binay but if Duterte runs, he will vote for Duterte because he is Bisaya and Duterte is Bisaya (even if just speaks Bisaya). Same with the Marcos vote in the north – the Binay crowd will move to Marcos if both Binay and Marcos runs. Sadly, Roxas does not carry any kababayan votes. And franktly, most Filipinos know Roxas will not win in most foreseeable future scenarios. Poe should convince powerful regional leaders to stump for her. Mangudadato speaking for Grace Poe in Maguindanao, Chavit speaking for her in Ilocos Sur, etc. These will break through the CDE classes. Pardon me but I can’t stop wondering where all these beliefs and prediictions that Roxas can not get votes except probably from surveys and paid media. Roxas won against Binay in 2010 may be by more than a million votes if he was not cheated by the x,y,z. Not because of Korina too will he lost votes of the masses because mostly those who’s afraid of and dislike Korina if you analyze them are not from CDE but the brainwashers, nincompoops of the righteous. I think the approach will work for any candidate, and the best at doing it has a big advantage. I don’t know how much pull Grace Poe has with the regional power people. Nor Roxas. I think Marcos can’t win because he can only pull in his own region but not the nation. Binay has bought a lot of regions already. My two cents worth. First, we need to understand the root cause of the problem we are facing right now. As I have said time and again, you can’t reach out to a hungry and desperate man. You have to give him hope that things will turn out well. And that is what Binay is capitalizing on, even to the point that he likes to be looked upon as a modern day Robin Hood. And in so doing, he creates a wedge between the rich and the poor with him identifying himself with the latter and as a knight in shining armor to their rescue. He knows fully well that the CDE voters far outnumber the AB sector. And what I’m saying is not purely theoretical in nature as this has already been proven during Erap’s time. So how do we turn around the dilemma we are in? You have to set him up against somebody who the CDE voters could identify with. I have nothing against Mar Roxas but the Binay group is projecting him as one on the other side of the fence as he comes from a rich family. The Pulse Asia and SWS surveys, no matter how questionable it might be, speaks for itself. I am not campaigning for anybody here but my main concern is the debacle we will face if Binay wins. So going back to a worthy opponent who the CDE voters could identify with, I believe would be in the likes of Grace Poe. She has overtaken Binay in the surveys because of the booboo that Tiangco and Bautista made in maligning her. The CDE and to a point, the AB voters also, took up her cudgels and came to her rescue. That in itself is an indication of her popularity and winnability, which could also have been brought about by the masses identifying with her adoptive father, FPJ. Whichever, I see her as a real threat against the ambitions of Binay. Another factor that we should try to consider is that the people are sick and tired of the corruption in government. I don’t blame the Aquino government for this as it has already been imbedded in our society even before he took office. In fact, he has done fairly well in minimizing the corruption. Of course, we cannot do it overnight, so we need somebody to continue his advocacy. Although Duterte has already said that he is not planning to run for the highest position in the land, he still placed third in the surveys, outpacing even Mar Roxas. Why? The way I see it, the people have lost hope already in governance and are inclined to vote for somebody who could stop the corruption no matter what it takes. There is one common denominator, people, in general, say that politicians are all the same, they are corrupt. And what is Binay’s battle cry. The country needs somebody with “experience” to lead them. And so, let that be his “déjà vu.” People are saying, experience in what – Corruption? We would rather have an inexperienced leader who would look after the welfare and well being of the country. A nice analysis for the Poe case. The Roxas argument is, we are busy working right now. Duterte is, if I can stir up enough popularity by being outrageous, I’m in. Marcos is, I’ll stir up trouble to be visible, like a hero, running against the establishment, like Binay. This is the state of things today. Angle no. 5. If it will be Sen. Grace Poe who will ultimately challenge VP J. Binay for the presidency in 2016, Comelec should organized a series of presidential debates to be scheduled every week 10 weeks before the presidential election so that the people will be able to gauge the charisma, the program of govt., the sincerity and humility of the man or woman who wanted to become president. The presidential debates conducted in Filipino language should be held in 1. Laoag, Ilocos Norte, 2. Dagupan, Pangasinan, 3. Quirino Grand Stand at Luneta, Manila, 4. Batangas City, 5. Legaspi City, 6. Iloilo City, 7. Cebu City, 8. Davao City, 9. Cagayan de Oro City, 10. Zamboanga City and should be lived telcast and with simultaneous radio broadcast country wide so all of us will be able to hear what can we expect from Pambansang Umay or Amazing Grace program of govt. and sweet and sundry promises? Yes you are right, if it will be Sen. Grace Poe who will fight with the perceived political behemoth gone awry, Coco Martin and other movie personalities will pitch in and man the barricades by going around and visiting the more remote places around the country to let the voters know who is Grace Poe and how she will be a champion of the MASA and not their poker faced old kid in the block? . If COMELEC stages debates, they could not pick the two who would debate. So Roxas and others would be there, too. You have made the pro-Poe case for president, which is not really the subject of the blog. The approach you cite could work for any candidate. The subject of the blog is how to speak to the CDE class that is sold on Binay. I have a suggestion. Aside from the “Stop Binay” rally, can someone (not me coz i am only an average earner, though i am willing to donate) sponsor ads in TV and radio that says, “Wag iboto ang MAGNANAKAW!”. No reference to any politician. Just a simple tagline, “Wag iboto ang MAGNANAKAW!”. This will I think put seeds in the mind of the filipinos, esp if heard/seen repeatedly and will become part of their decision making when they vote. we could wear shirts or put pins, with the words “Galit ako sa MAGNANAKAW!” Mainly, to me its awareness, and also, i think the word “magnanakaw” has been associated with the Binay’s already. Newspapers have very little impact. It only has 1,000,000 in circulation among 100,000,000 Filipinos. 2ndly, Philippine Media are run by U.P. graduates. Alma Mater is thicker than water. They protect their own. Like what the U.P. Chancellor Michael Tan said yesterday advising U.P. Lawyers not to defend U.P. Fraternities. Unknowingly Chancellor Michael Tan is saying they defended violent fraternities and crooks and that includes The Binays. Excellent idea, Didi. Maybe the Stop Binay movement will pick up on that. I know t-shirts against corruption are starting to pop up, probably people like you who have decided to do something on their own. This postulate has leg to stand on. The statement scares me. If anyone cares to look back in time the regime of Marcos Crime Family declared Martial Law to perpetuate corruption and enrich themselves thru absolute power like dictators all over the world. Filipinos hate history. That is why they repeat it frequently. Yep, and keep throwing trash in the rivers . . .
CONDONATION verb. Accept and allow (behavior that is considered morally wrong or offensive) to continue. The Binays, in their defense, seeks Condonation of their action. Mass of voters elected The Binays knowing fully well of “his life and character, and that they disregarded or forgave his faults or misconduct, if he had been guilty of any.” The defense itself is an admission of guilt. Condone is also an act to forgive. A person or an entity cannot forgive a Crime Family if they have not found guilty or not committed a crime at all. Since The Binays made Condonation Doctrine defense, therefore, they admit their crime and guilt. Only Sereno and her crew can make a decision, Condone or not. Forgive and Forgets. More of the Same or not. Sereno has found The Binays guilty. She already have pre-judged the case by making irresponsible statement that Condonation Doctrine is “outdated”. Sereno and her crew refused to recuse from the case. What is confusing is why Sereno would even bother to entertain the Condonation Doctrine in Court of Appeals vs Ombudsman when The Binays have not been found guilty yet or admitted of the crime. On the other hand, Sereno should entertain the Condonation Doctrine because The Binays hiding behind this Doctrine is already an admission of Guilt. CONDEMNATION noun. The expression of very strong disapproval; censure. The Filipino people have not massed in EDSA to exercise their Condemnation Principle. They massed against ERAP-Para-Lahat-Pantay-hERAP not to The Inglorious Binay Crime Family. There are hodge-podge of STOP BINAY people. Disorganized. No clear leader. There seems no organized Pro-Binay demonstration in show of support. Are we Polarized? Numbed? Busy posting selfies on Facebook and Instagram? The street parliamentarians, STOP BINAYS, can short-circuit Sereno. They have all the rights. It’s written in the 1st Amendment. They used this against ERAP. Against Marcos Crime Family. Sporadically used against Benigno’s mother who has the most attempted failed coup-de-t’at in Philippine History. It worked! FILIPINOS SHOULD ACT. THEY SHOULD MAKE THEIR VOICE HEARD WHERE THEY STAND !!! STOP FACEBOOK !!! STOP INSTAGRAM !!! STOP TWITTER !!! STOP TELESYERES !!! STOP BINAY !!! They will. The Stop Binay rally on July 9th will be large, I project. The third one will be giant. These are disparate thoughts and mesages to different segments and needs to be synthesized. Filipinos are a great peopla and when I mean Filipinos it does not only mean people born with Filipino blood but people who live here and has made it their home. What is not so great is what our country has become. It has become a place where people lose dignity because poor people are forced to become mendicants by the corruption of government. Why mendicants. Because we are forced to be bow our heads to corruption because of a cake and or a cash gift that is not even enough to sustain us for a week. We are forced to bow to corrupt people like a certain former mayor and now a very corrupt vice president. Well I say enough is enough. I refuse to dishonor you like this. I refuse to give you the dignity we all deserve. We are not a nation of mendicants but a nation of builders and givers. I have seen this in all my travels through out our country I have seen how the people who have the least among us gives so much to those with even less. I refuse the leader that leader who will have you grovel for health care and education. You are poor because of the countless officials who have made the government coffers their personal campaign fund. You are poor because of the culture of impunity that is operative in our nation. There is dignity in your lives of struggle and it is with great honor that I seek a government to equal your nobility. I may not have your background, I grew up with every conceivable advantage that one may have but we belong to a common nobility. The nobility of brotherhood forged with hardwork and fairplay. Basically The message is I am the man who will fight for your right to the dignity of hard work. I will be the one who will help you in creating a country where government service is not surprising when effective. Remember CDE are and can still be aspirational. THe message is that I understand that is takes a clan to educate a single college graduate. How this graduate then has to find a way to go overseas to find a job that can support the education of his younger siblings. People respond to people who feel understands them. People respond to people who makes them part of the solution to their problem. The gist is you have been doing your part since time immemorial but 6 years is not enough to fix a damaged culture. It is not enough time to create a government that helps you. Because the Filipino is a proud people. Ayaw ninyo ng limos/you do not want alms. You just want a fair chance. Same here, my wife is threatening to un-blog me. The Society of Angry Wives. Which reminds me, I have to go wash the breakfast dishes . . . I believe you have gone right to the heart of the matter, and that is indeed the winning formula. Binay can preach the message, but it clashes with what is happening in court. In answer to your question of how to break through an erroneous perception of a member of the CD/E socioeconomic class, I’ve plagiarized this from that profound philosophical treatise How to Win Friends and Influence People by Dale Carnegie. 3. Arouse in the other person an eager want. (e.g., if the voter has children, money for better schools might be something he/she eagerly wants. And you can then show how ending corruption by electing men of integrity can make that a reality. 4. Be a good listener. Encourage others to talk about themselves. (Seek first to understand before you seek to be understood. 5. Talk in terms of the other person’s interest. 6 Make the other person feel important — and do it sincerely. 7. The only way to get the best of an argument is to avoid it. 9 If you are wrong admit it quickly and emphatically. 10 Begin in a friendly way. 11. Get the other person saying,”Yes” immediately. 12. Let the other person do a great deal of the talking. 13. Let the other person feel that the idea is his/hers. 14. Try honestly to see things from the other person’s point of view. 15. Be sympathetic to the other person’s ideas and desires. 16. Appeal to the nobler motives. 18 Throw down a challenge. There’s more but most of it is how to be a better leader. Besides this is enough. Joe, this is ‘way off topic but i’ts been bugging me for several days and maybe this comment may be the catharsis that I need. I’ve known this song for maybe 40 years but hearing it again recently I realized it is a perfect description of Privilege. Do you know that lady? I know her. Several of her even. Rich father, rich husband. Graduate of the best schools. Studied for a couple of years in Europe. And then I began to wonder if this is a clue to the answer to a question that has troubled me for years: How do corrupt politicians and bureaucrats justify their betrayal of the people they were elected or appointed to serve? Could it be that they believe that things will always be as they are now, even in the afterlife? That even in Heaven, they will still have Privilege? From my limited acquaintance with the NT, that’s not the way it works I’m reminded of the story of the rich man and Lazarus, the beggar so poor that the dogs of the village came to lick his sores. There will come a day of reckoning. But I could be wrong. Maybe they are right. Maybe there will still be Privilege and with a word they can get what they came for. Stairway to Heaven. That would most certainly be about the only way to explain how Binay believes he is doing God’s work. I think the nation needs to study Jesus a little better. PNoy can/should set the example. Does anybody know for sure that he diligently studies the Bible? O4r what bible he uses? I think that is a personal matter and would not be interested in knowing the President’s private matters. My remark addressed common standards of respect and compassion and good deeds and – for me – the disconnect that seems to exist when so many of the faith can justify corrupt deeds. Joe, you had broached “Jesus” in this thread and I happened to come upon the matter. How do you (or others here) think one can study Jesus better? Why study Jesus at all? Can he help solve the problem like Maria … oops. … Binay? And many other problems? Perhaps there are Christians here and they will chime in. The subject of this blog is communicating to the CDE class and I’d ask that we stick to that topic. Study of Jesus is way off. Loved the Heart rendition of it when the Led was honored at the Kennedy Center. Senators, Congressmen, bureaucrats, are you listening? Muscle, brain, money, network and the perception thereof. Muscle to me means organization. Brain means a lot of what is being said here, how to speak to the CDE class. And AB, too. Money to get the message out in a powerful way. Network to deploy people in a powerful way. Perception, for people to see the competence. 1. Theory. History proves that the CDE voter is emotive and reactive, and needy. 1.1. Needy. Primarily, the CDE voter is concerned with his “deficiency needs” – his physiological and safety needs — as stated in Maslow’s hierarchy of needs. In this, he will attach to a candidate who offers safety in terms of security or in terms of subsistence. 1.2. Emotive and reactive. Secondarily, the CDE voter is swayed by emotion, which corresponds to the love/belonging layer of Maslow’s hierarchy. He votes with his heart and not his mind. In this, he will attach to a candidate who moves his passions towards positive humane feelings. Conversely, he will dismiss a candidate who ignites his negative passions such as hate and anger. 2. Analysis 1. Given this framework, let us look briefly at the past six presidents. 2.1. Marcos. Marcos was the epitome of the strongman. He answered the need for security in terms of peace and order. When Marcos spoke, he markedly introduced steel into his voice and declaimed at a lower register. 2.2. Cory. Corazon, as was her name, invoked heart. Her victory stemmed from two emotive sources. The emotion of grief summoned from her husband’s assassination, and the emotion of anger summoned from the kleptocracy of the dictator and his conjugal partner in crime. 2.3. Ramos. Ramos was another strongman. He figured in the overthrow of the dictator and in the protection of democracy’s savior. As a general, he brought to the nation a much-needed security that was threatened and fragile under Cory. 2.4. Erap. Erap evoked the emotion of belongingness and humor. He portrayed himself as champion of the poor. Humor, whether directed outward to others or directed inwards to oneself, as in the case of Erap, is an effective political weapon. This is evidenced by the clowns in the senate such as Sotto, Lapid and Binay. 2.5. Gloria. Gloria, for all her puny size, was a strongwoman. She wielded patronage as deftly as Marcos. Behind her stood the first gentleman with his hefty weight and size. 2.6. PNoy. PNoy was carried to the presidency on the groundswell of the emotion of grief at Cory’s passing. It is to be noted that he triumphed over Villar who offered the security, not of peace and order, but of subsistence. The lesson is that the CDE voter will cast aside his safety needs in favour of a higher order of emotion. 3.1. Angle 1. From Binay’s perspective, this is directed to the CDE voters’ basic deficiency needs. From JoeAm’s viewpoint, the counter is not to confront the voter but to exercise empathy and to rechannel the deficiency needs to another candidate. The problem here is that Binay has built his pro-poor image over the years, and no candidate, other than Erap, can challenge him at this level. 3.2. Angle 2. This is the use celebrity influence. This is an appeal to love/belongingness. This approach will work for die-hard fans but not otherwise. Celebrity influence may not change personal preferences because of compartmentalization. Survival needs are more basic than the sense of identification with an idol. 3.3. Angle 3. Bandwagon mentality is the essence of belongingness. Here the importance of the results of surveys will play out in the succeeding months. A Poe bandwagon has started to form and is gaining steam. 3.4. Angle 4. This is by far the most radical proposition. It reaches to the two top layers of the Maslow hierarchy, that of esteem and self-actualization. I am afraid this appeal to reason is too nebulous for the CDE voter whose concerns are more basic. 4. Analysis 3. As I see it. 4.1. I will grant that arguing rationally with the poor is an exercise in futility. 4.2. To me, Angle 2 is somewhat effective but weak. I am sure Jim Paredes has many followers and admirers, but I would hazard very few come from the CDE classes. 4.3. Angle 3, in consonance with the rechanneling suggested in Angle 1, may be also partly effective. I would suggest not only a pro-candidate bandwagon but also an anti-Binay bandwagon. There are social media sites against Binay in Facebook and in blogs. The problem here is that of reach. We do not know the degree of computer penetration, and the CDE classes may not have widespread access to cyberspace. 4.4. I made a point in 2.6 of how high-order emotions can make the CDE classes overlook their deficiency needs because of a deeply felt national event. 4.4.1. The senate hearings have contributed hugely to the diminishment of Binay’s image as savior. He is now more clearly limned as a predator and peculator. And yet the headlines have barely dented his standing with the CDE classes. 4.4.2. It appears that only death – Ninoy’s, Cory’s, the SAF 44 – can call the swaying mass and turn their eager faces. I do not suggest that someone die… but it may help. 4.5. Levity aside, the strategy of belongingness adopted by Mar and his advisers has backfired. Mar sought to portray himself as one with the CDE voter. He should have gone in the opposite direction, maintained his actual status as lord of the manor, and stressed the distance. But hindsight is always 20/20. 4.6. A momentous national event that could trigger the right emotions in the CDE classes would be the bringing of plunder charges against Binay… and his detention with his cohorts. Then we will have not a Dos Equis but a Quatro Equis of jailhouse beer – Binay, Enrile, Estrada, Revilla. As always, I enjoy reading your analysis, and I find little to argue with. Empathy, celebrity endorsement, bandwagon against Binay, national success. None will do the job, agreed. Yet, I think each is a tool in the toolbox. If it were up to me, I’d use the first three tools for sure, in the most powerful way possible. A part of the “celebrity” endorsers would be name people, as Poe will get Estrada and Roxas is trying to get Duterte. And local governors and mayors. Binay’s strength. There are other steps beyond these tools. How skilled a candidate is at putting together an organization will make a huge difference. The vote-rich cities that bring in a million votes or more are crucial. Get one or two to break the sister city agreement and maybe that house of cards will collapse. But as far as speaking to the CDE class is concerned, empathy, emotions, sincerity (Roxas problem by trying to go DE himself). Agreed. Trillanes is a one-man wrecking crew. The senate hearings have demonstrated that. His latest revelation that the two most trusted aides of Binay have fled the country is another huge swing of the wrecking ball. The issue is: Are these tasty news morsels reaching the CDE class? And if they are, are these morsels changing their perception and their choice? I believe the steady fall in Binay’s popularity suggests they are changing perceptions. I think the hammering has just begun, myself. He left the cabinet to be free to attack the Aquino administration. Now, all the people he has offended with his arrogance of style – blame and shift the problem to decent people – are free to attack back, making him the bulls eye for a nation getting increasingly impatient . . . nay, outraged . . . with his “style”. 5.4.1. The unclassifiables — Roxas in particular — do not seem to fill the primary or secondary needs. Hence their poor standing. 5.4.2. Grace is in a sweet place. She gets the sympathy vote for the robbed-of-victory death of her adoptive father, and she also gets the needy vote because she has projected a strongwoman attribute in her secretiveness and in the senate hearings. 6. The Philippines is far from recognizing candidates that fall into the aspirational layers of Maslow’s hierarchy. 6.1. The CDE classes would not be able to recognize inspirational leaders like Kennedy and Obama. I believe there were candidates that fit the mold — like Raul Roco for one. 6.2. Beyond all expectations, PNoy has turned out to be one. 7. The pattern of our politics, our needs and their satisfaction, are circular. We need to see this so we can break out of the stultifying circle. His family’s Dynasty is better than other Dynasties. I take it back about Angle 4, Joe. Okay, as written, it is slow-burn. But there might be a way to distill it into a harder-working approach. But it requires changing our mindset. Instead of thinking demographics and putting a divide between AB and CDE (Some, including me, would put it at ABC and DE), think psychographics. Then you can concentrate on finding the values and interests that are common to everyone, rich or poor. It will also take care of flaws in the demographic approach. After all, being rich doesn’t necessarily make one smart. Even lotto winners are suddenly AB. That would mean that your speech for makati business club would be less technical or less verbose,because that would be the same speech to be delivered to the masses. 🙂 You are absolutely right. Thanks for making this point about about common interests. It was unsettling that so much of the discussion has centered on CDE as gullible (to Binay) and manipulable (by “us”). History is rife with instances of ABs being taken for a ride–or standing timorously or absentmindedly on the sidelines. Instead of giving them a thousand or so,you still have to promise them additional cct,.If squatters you promise them good relocation sites with running utilities,access to transport work nearby.A school nearby is a good promise too.These promises may sound generic at least it can be done. I got a reality check after visiting some homes of Gawad Kalinga. The revelation was pure Filipino. The one home, one family could only last so long. Pretty soon it became one home, one family ++ and homes could not be build fast enough. But try we must, and move to Gawad Kalinga phase II and III. Try we must. With so many vision killers,show stoppers,deal breakers;all we need is ? Check. The promises have to resonate, and be realistic. Lets try the visual angle, painting (images of) Binay as a rich politician- haciendero ala Pavarotti, THAT HE REALLY IS. Even the AB should take that in as basic truth, Binay is richer than most AB voters, that all of us are bobotantes, that Nogi’s wife is a study in plastic surgery, and that diamonds are beautiful against black skin. Lets call in the likes of impersonator supreme Jon Santos and have some real fun. Ang maybe, call myself, nogie,(aside from being fellow bobotantes) too, to take the sting out form trolls repeatedly calling Binay NogNog… brown or dark brown, we are brothers (and sisters) all. For me, these name calling diminishes the truth that about Binay that we are imparting. The message is lost, what is left is the victim/bullied/underdog status of both Binay and the CDE (or AB) voters. Important words. We objectify the CDE for purpose of analysis, as do the survey firms, but that ought not designate a higher or lower quality of being. Humility is important, I think, as Vicara has pointed out. Which raises the question, is it manipulative to try to figure out how to persuade others to change their minds? Is it education, or is it manipulation? We should continually aim for voter education and information update re daily political issues and pronouncements by our honorable government leaders sans insults and name calling like the “black knight, king of darkness, foundling, motor cycle stumbles, teka teka king” Definitely not manipulation, just eye openers. Ridicule may (per manuelbuencamino) or may not (lilit) work for the CDE voters depending on the degree of support they have for a particular candidate. All the angles you enumerated and suggestions proposed by commenters are OK but ineffective without the visible support of a great number of people, like: the size seen when Ninoy Aquino was assassinated and people bravely marched to demand “Justice” and end to dictatorship, the thousands of people who came out of their houses to line up the streets when the funeral cortege of Cory Aquino inched its way from the Cathedral to Manila Memorial Park; and to a lesser degree the size of the crowd generated by the call of the first (and I mean only the first and not the 2nd or 3rd) Million People March, which was sadly appropriated by Anti-PNoy forces. I am thinking – after having read the article written by Yvonne, that a movement that calls for the Supreme Court to strike down the Doctrine of Condonation could be the best and immediate solution to rid our country of corruption. Corrupt politicians can no longer avail of this abominable doctrine by winning an elective post by hook or by crook and by any and all means in between. I think you are right, mcgll. The candidate who wins in 2016 will be best at organizing his approach and gaining that visible support of a great number of people. 3. Promise bonuses for teachers, increase in salaries, etc. because it is the teachers who will man the precincts come election time. 4. Ensure the provincial governor is aligned with your program. If not, get an opposition leader who is credible. 5. Print out komiks on why BInay is not fit for the Presidency – and why there is a need for somebody to continue the work of President Aquino. Do not use the catch phrase “Daang Matuwid” as this is already almost destroyed by the Binay mouthpieces..
Tell the CDE class what PDAF and DAP has done to the country in simple language…because the Binay mouthpieces are using these to destroy the government’s credibility. 6. .Print in simple languages the facts unearthed by teh Senate inquiry into the wealth of the Binays – how it happened and how much they have accumulated.. how much debt the City of Makati has because the BInays have used up all its revenues; with the end in view that the conclusion to be drawn is that our country will go down the drain if we have Binay as the President. 7. Paint a picture of how we will become if we have BInay as President vis-a-vis the China’s claims of our islands – the reason why China is claiming these islands because of the mineral deposits, etc. IT’S A DO-IT=YOURSELF COUNTRY SO HE KNOWS HOW IT IS TO COOK, TO DO TEH LAUNDRY, TO IRON, ETC. Why wouldn’t you like # 2? – Loyalty check and promises to the local executives? If the VP cando a loyalty check on his sister-city mayors, why not the DILG secretary whose turf includes all the local executives? – he being the head of local government? I like the first part of 2, the loyalty check. But too much dirty play muddles the message. And what I meant with a “tooth for a tooth” is that the Roxas group should have the statistics ready to counter whatever statements the VP group is suing to destroy them. Like for example, saying that there is “selective justice for the Binay family ” – then, the Roxas group should be able to explain to the CDE class that there is NO selective justice, that there are real issues supported by documents about the Binay estate, Binay corrupt ways in bidding, etc. and that there NO truth on the PDAF, DAP, etc. by citing specifics. That’s the language the CDE class understand – tackle the issue head on with specifics and NOT JUST BY SAYING NO! NONE! INCORRECT! thank you chit Navarro. to me these are the retrospective thousand words that thus had described a simple photo of Mar Roxas being sworn in as PH President (P Mar) from 2016 and beyond. It’s worth in pesos more than several hundred thousand more than what tradpols tacticians and strategists can dish out to their candidates. But Please don’t forget Mar’s political party and party mates, they may be old and soiled but much preferable than looting clubs and gang mates of thieves. These chit’s cogitation is tangible, concrete and at once passes the test of : is it feasible and doable? So far It is the best detailed blueprint (I have read so far) for action adaptable and per se adoptable by any candidate who plans to put down corrupt adversaries. As expected if I may say so, I see bloggers here has started to flesh out some more the bones of actions to make them stronger and lethal. Others are adding new ones to make this book of Chi Navarro solid like the marbles of Romblon Island. The subject of the blog is speaking to the CDE population, not promotion of candidates. I’ve restrained a pro-Poe advocate and don’t want the discussion to go down that path. I ask respectfully that we try to stick to the topic on this particular blog. My action would be to terminate the discussion if we get too deeply into the partisan aspects. I try not argue Joe Am, but just to contextualize the right thing you said about focusing and staying within topic. For more insights you asked the question : “If you were a candidate, how would you propose speaking to the CDE community in a way that connects?” To which I wrote back: “JoeAm with that question you just DIVED into the Amazon, the Yangtse, the Ganges, the Nile, the Danube, Rheine and Seine and the Thames and the Hudson or the Delaware. Just think of the variety, compass of the answers you will get.” And may I add now because of the changes in microseconds of those rivers’ water content, they could transform into thousands plus rivers in a flash. Not surprisingly I think that’s what happened in this blog thread or stream. It could seemed to a few readers Navarro and Canjeca if they were candidates they will do more than speak to the CDEs. May be some people will prefer not to lecture and convince the old woman after being mugged not to go out at night but will prefer to tasser or by bullets on the legs, to disable the muggers . My last word on this topic Joe Am. I basically relented, recognizing that restraining to the subject was futile. Generally when I write, I have an audience in mind. It may be the Society members (commenters), it may be an agency of government, it may be university students, it may be protest organizers, it may be leftists, it may be senators, SC or even the President. (I have not yet tried to speak to the House because it seems like an impossible mass of convoluted humanity.) On this one, I was thinking of presidential candidates (or their staffs, more likely), and I was hoping to give them the best ideas the Society had to offer. To go off down political paths would detract from the brainstorming. But it is what it is, so no worries. On number 2: “Loyalty check of each mayor especially if the town is a sister-city of Makati. Have a one-on-one talk with this mayors and promise them the moon and the stars, if Binay promised only the moon.” – Most trapos base their decisions on the winnability of a national candidate. If you succeed in persuading the CDE classes and improve ratings, LGU support will follow. On number 5: I would suggest AM radio drama productions, for a wider reach to those without access to TV. This does not have to be a campaign against Binay. Appeal to emotion, and persuade listeners to choose the right leaders. Marcos is repugnant. But if I were Roxas, I would do everything I can to encourage Bongbong to make a run for the presidency. That will ensure a serious split of Binay’s votes. To reach out to the CDE class, I would form a special cadre of youth supporters. It’s very tempting but I will not call it YOUTHS AGAINST BINAY, but rather YOUTHS FOR HOPE. Who are the members of YFH? — successful and talented young professionals who have gotten out of the poverty trap. These are your ex-CDE types, whose parents are still probably CDE’s. These are most probably Binay haters. These are the people who understands the dangers of Binay. They are full of energy and anger at Binay, but find themselves helpless to do anything. Where do they come from? You can find them everywhere, in Facebook, in Yahoo commentaries, in blogs. I would scour the entire nation to locate and identify and get them to come together to do service for the nation. What will they be taught? Give them an insight into the governance of the country, how the country is moving along, why Binay is a danger to the country’s future (many do not understand that if Binay is President, all international banks will avoid Philippines or up their rates). In other words, get them into a participatory mood. Remember, these are intelligent professionals. Get them to really understand the threshold the country is at — a strong presentiable in Binay with an un-swaying CDE class. What will they do? They can be the critical catalyst of change to the CDE mindset. These YFH will be organised into activist groups to do outreach work. They will go into every barangay and just talk to people. What will they talk about? — Do an Anthonny Ceasar. I came not to kill Binay. Binay is good — he gives out rice, sweets and wheelchairs. Talk of how they were so poor like them, how they suffered, how they finally got out of poverty, how it’s possible for their children to get out of poverty, how tough the job of the government to provide education and jobs for people, how corruption can take away all these opportunities for the poor …then go in for the kill…. Simplistic I know. A more professional scripted needed. Why will CDE listen to YFH? — Because they have street credibility (someone mentioned this) and they got Jack’s “kababayan effect”. YFH is wishful thinking — it’s too late in the day. Again, I resist making this a Roxas blog, and what you say can be used by any candidate. The missionary approach you recommend is, I think, perhaps the most powerful mentioned so far at actually talking to people in their own terms. The logistics would be a challenge. One would have to strive for a large force and pay for travel, room and board. And maybe even protection services in some areas. But it could certainly be another tool in the tool box. Great idea. Very good angles Joe. Maybe those are the angles that the anti-Erap forces missed in 1998. But I would also add that the anti-Binay forces must also ridicule the man. Nobody wants to be identified with an object of ridicule. People are more receptive to positive messages when they stop believing what the ridiculed man says. By the way, Grace Poe has already spoken out on presidential pardons – she will not pardon BInay if he is convicted – and that’s one of the reasons why Binay is throwing everything at her. Ah, thank you for the info on Poe’s stand regarding pardons. Do you have any insight or guesses as to why Escudero met with the jailed senators? I can’t figure that out. I agree ridicule is another good angle, but the sharper it is, the more removed it should be from the candidate himself. However, pointing out that Binay has no standing to criticize when he has not answered corruption complaints is a soft form of ridicule, and is excellent. The candidate can use that. Chiz Escudero is playng the good guy to the jailed senators in contrast to the “no pardon”statement of Grace Poe. Senator Poe mentioned only no pardon for VP Binay if found guilty – she was silent on the jailed senators’plight. Perhaps, that’s what Chiz Escudero wanted to project to them. I went one step wilder, what Estrada would expect in return. Backing from the three senators’ political machines in a split from UNA. Very hazily put on the table. I used to dabble in fiction so can project new realities. Thank you Escudero and town mayors…let us not let the lies of Binay and his spokesmen go uncorrected, lest his hold on CDE class go unchallenged. Ah, thanks, chempo. I saw the Escudero comment but not the town mayors’. Out of curiousity, who here is going to vote for Mar Roxas? I’ve requested that, for this blog, we not go down the path of evaluating the candidates or go off topic but stick with how to communicate with the CDE class. Thanks. charlesenglund: I am, along with my family and my helpers and their families regardless of Grace Poe’s possible candidacy for president. It is not difficult to communicate with the CDE class, they listen and understand, as long as you know how to deliver your message. I have spoken to drivers and caregivers and waiters and elevator operators and plumbers and gardeners and deliverymen and sidewalk vendors, and even the lady attending to the photocopier in a mall. I have yet to come across anyone who would vote for Binay instead of Mar. It is a little more difficult to talk to those in the AB class who can only mouth Binay’s own claim that he is a good manager, and never mind if he is corrupt. I heard that from someone who belongs to the upper class of society. Sad and infuriating. true, one businessman cousin of mine reacted to one of my posts which I flooded in my FB account…he did exactly that, mouth Binay’s own claim that he is a good manager, that is. He concluded his comment by saying Binay pa rin sa 2016 (shades of Marcos pa rin by some misguided young and not so young people)…grrrr! They also believe that Marcos was our best president ever and is sympathetic to Arroyo. Binay and the UNA group will coalesce with the Gloria’s Lakas party, and who else, Bongbong Marcos? Talk about birds of the same feathers etc…. He belongs to the AB group, those with more than 3 shiny, brand new cars in their garage and whose family are frequent fliers in and out of the country. I wonder how many of the CDE class clients they can influence. I am voting for Roxas and have started spreading the word around to my circles that I can influence. But that is beside the point because this blog is all about reaching the CDE class which is said to be the powerbase of Binay. In addition, I would suggest we stop calling the CDE group “bobotantes” because it is very demeaning – they may look that way from our own perception but to them, survival is the reason why they would trade their vote for P500.00.. But if shown a probable / possible future of survival for a longer period of time in lieu of the one day survival that the P500.00 will give them, then there maybe a swing vote from these group. for decades I have move (though nor really live) in the world of Filipino farmers and fishermen, I know first hand they are needy but never bobos. They can be pilosopo and often corrected my notions but they are never gago or dishonest. The thoughts and words that I spout are richly tainted by their genre. 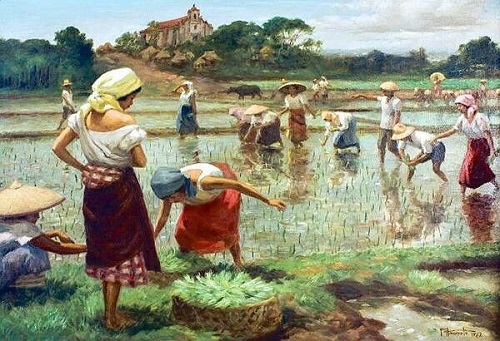 Look at the thematic picture of this blog piece by Amorsolo. Want to talk with the CDE class about Binay? Talk sincerely and honestly. Don’t sucked up to them. Don’t condescend. Treat and make them feel as equals. That’s the first marching order on those who will do the work. The coverage of the ‘talk’. The past, present and future. The PAST. We have to acknowledge that it was an honest mistake to oust their candidate, Erap, and replaced him with a more corrupt and cunning Gloria Arroyo. Erap’s dismissal which amounted to their own mutual feeling of rejection is a fact we cannot ignore if we intend to have an honest conversation with the masses. The cheating done to their next idol, FPJ, and his subsequent death confounded the hurt they felt following Erap’s ouster. That’s a fact we have to bring to the discussion table not to be sorry about it but to commiserate and express understanding as to why they are sticking to another guy they see and think as another savior or another man of the masses. And why they should be concerned about the PRESENT. VP Jojo Binay is facing a series of investigation on allegation of corruption cases. He is topping the surveys not for that but for the support of majority of the CDE, in spite of that, who stands to ‘benefit’ and suffer in case he wins the presidency. Why is that? They will ‘benefit’ because they finally, again, we’re able to put their own bet in Malacanang. That’s all the benefit they will get. They’ll suffer because he is really not what they think he is. He cannot even face the Senate on corruption issues pending before it. If he is really innocent why be afraid to face the investigating body and answer questions? They have seen the outstanding issues waiting to be answered by Binay in Makati. Are they going to allow such issues to reach a national proportion by making him president? Aren’t they going to challenge themselves by requiring Binay to be more transparent and honest about his past by confronting his accusers and at the same time prove to them his innocence? It’s really up to them. We can only remind what is at stake and the risk people are taking in opting for a Binay presidency. All the detrimental signs are there for them to contemplate about their decision to stick with him. A decision which, if remained unchallenged, will unfortunately seriously affect our FUTURE. A president who has corruption allegations hanging over his head will not be able to steer the country in a calm and stabilize environment. A president whose family is entangled in corruption cases that monopolized a city for so long will not only have an image problem but will suffer credibility problem as well. The CDE class might ask the other side as to who they support or who they recommend in place of Binay. The answer would be, the exigency of the time requires that we all vote according to our conscience so long as it is not Binay. Filipinos, ABCDE, all, will never be able to sleep soundly and be confident about their government having in mind the Binay family manning and guarding the national treasury. My point is I would like to tell them that manipulation, cheating and plunder are bad, whether done by Erap, Gloria or Binay. Anyway, those of us who ousted their idol Erap was eventually proven right by the subsequent conviction for plunder by the court after a very long and credible trial. I won’t even try changing history in any way. I will try to tell them these without hurting their feelings and ego as I believe that it is not compatible if we say we commit a mistake in ousting a convicted plunderer Erap, and then at the same breath, convince them not to vote for another alleged plunderer Binay. An honest mistake in the ouster of Erap refers to the people power which preempted the conclusion of an impeachment process in the Senate that would have been the proper procedure to follow. Clearly, ousting a sitting president, one elected by a wide majority, without conviction or in contravention of the law is a mistake and we have to be honest about it if we want those people to trust us. Whether one is an Erap supporter or not, there was a violation of the legal process there. The acknowledgment of the mistake has nothing to do with the plunder issue. It’s all about the procedure that got waylaid because of the mob rule existing at the time. Erap’s followers must realize that we do not have the monopoly of good behavior. We are no better than them, hence the acknowledgment of the cause of their hurt on that part of our history. We’re not talking about the court case and the subsequent conviction of Erap. We are talking about the way he was hastily convicted without the benefit of a trial. Those are two different things. Most of his followers were hurt and felt aggrieved not by the court process for it came much later on but on the treatment their idol got when he was forcibly ousted. Putting emphasis on the crime of Erap because we feel it’s an honest and sincere way to engage his followers is not a good step to start a conversation. It’s an unnecessary poke in the eye that will surely render any effort of dialogue to fail. It’s adding insult to injury that will put the talks dead in the water in the first thirty minutes of conversation. And given the lowly status – economic, education, etc. – of the party on the receiving end of our effort to proselytize nothing is going to be accomplished. Telling them that manipulation, cheating and plunder are bad would also be seen as an implied insult. I don’t think it’s a good idea to even consider such approach. If I’m the one who’s going to talk to the CDE class and be honest about the facts I’m going to open up the conversation by admitting that Erap was railroaded in 2001. I get that they were offended and they have the right to be offended. And with that part taken care of, I’ll move on the other issues. The CDE class deserved a better treatment through honest and open dialogue from us and the only way we can do that is to acknowledge not our superiority over them but our own weaknesses in times when, like them, we are overcome with our emotions. Most of Marcos’ followers were hurt and felt aggrieved when he was ousted, but we were hailed by the world because of the success of the People Power. I don’t understand – we were right then and now when we ousted another bad president, we were mistaken? You don’t understand because you’re looking at issues and mixing up everything. Marcos, a dictator ruled for almost 20 years. It was 20 years of corruption and brutality. We don’t need to argue if the world will agree with us or not regarding his ouster. Regardless of his followers’ feeling it’s time to go. In spite of that, the Cory administration tried very hard to unite the country even though there was stiff resistance and opposition from the other camp, civilian and military, long after the Marcoses has been gone. That is why terms like reconciliation, unity, justice and even songs with ‘pagkakaisa’ as a theme were very popular back then. Erap’s presidency was cut short after a little more than two years. He was ousted at the time the legal procedure was in effect. Take note, he’s no dictator and he cheated nobody to win the presidency. Just the same the bandwagon called EDSA 2, driven mostly by people who are not from CDE and the anti-Erap politicians who were out of power, ousted him. They were one in saying Erap’s got to go and it’s time to have a clean and honest gov’t., so they’re taking over. The masses were not happy. In comes Gloria Arroyo. And what happened under her administration? Worse or better? What did the hurting Erap and his masses do afterwards? Enter FPJ. The CDE were overjoyed when he announced he was running against Arroyo. Then it was found out he, whom the masses heavily supported, should have been president had he not been cheated by Gloria. And then he died. People were disheartened and things were never the same again for the Arroyo administration. Even the current president’s mother apologized to Erap for her participation in ousting him. Now we are looking at statistics and aghast to realize that the CDE, the hoi polloi, the Erap’s masses, them who were rendered victims in recent past for the choices they made are now again threatening to support someone who claims he’s one of them and who will fight for them. That someone also happened to have questionable dealings that were coming out in the open which will make him the ideal candidate for rejection instead of promotion. So this article about “talk” and the perceived political lock on the CDE class. That’s the context of our discussion. And you are telling people that in talking to the CDE you’ll tell them what they already know. You’ll recall for them events, sadly etched in their memory, that transpired wherein they were emotionally affected, laughed at and ridiculed because they bet on the wrong guy and for what, to make them understand that you are against corruption, etc.? In other words, you’re going to rub salt and attempt to “talk” to them. You’re going to open old wounds while making them understand you? You’ll focus on letting them know your personal thoughts about the downfall of their idol and advance your own thinking regarding good governance. In other words, you’ll lecture to them. You’re all for expressing your thoughts on what’s right or wrong, which actually is unnecessary, and not the objective of the talk. What a great way to exchange ideas in here. There is an intelligent exchange of ideas coupled with respect – no name calling, no pretenses of “I am better than you”, just plain simple round table discussions of the topic on hand…It is a great way to enrich one’s perspective to the current events in our political landscape. I’d love for our next president to continue the present social programs of PNoy and add some more cost effective approaches such as those stated by the link below. I believe the HAPINOY Project of Sen. Bam Aquino (before he became a Senator) falls on this category… Only, the Hapinor Project deals only with “sari-sari” stores and is concentrated on uplifting “mothers”… perhaps the “Graduation” program can deal with the “tatays” and more on farm ventures – poultry, piggery, goat-raising, bamboo craft, etc. Hapinoy is an awesome program by Sen Bam and partners. I think it is telling that even if Bam is a senator right now he is not forcing this onto government. Take one asset, add self-motivation, a place to keep money, and weekly coaching . . . Assets that would work here, a chain saw, an insecticide sprayer, a truckload of seedlings for a citronella farm, motorcycle detailing products . . . worth a brainstorm. (Ha, in another blog). Would love to brainstorm in that future blog post. 1. A short video compilation of binay’s conflicting statements and lies for all classes to see, not only the CDE. Must focus on exposing the lies and the LIAR binay. Everybody hates liars, so that would be a big turn-off. 2. Convince them against binay but DON’T vouch for any other particular candidate. They may suspect the motive and the effort may backfire. The CDE class may be mis-informed but they are not fools. Like everyone else, they hate being played. 3. Talking to them from the heart, with sincerity. Kindle their love for the country. Make them realize that we have only one country, that there is no place like home. Show them how Filipinos are being mistreated abroad. Show them pictures of progressive countries in contrast to ours. Then tell them “Wouldn’t it feel good if the our Philippines would be like that country in the picture? And Filipinos would be treated nicely and fairly and looked upon with admiration in any part of the world?” Then tell them how more backward we can get with a crook as president. 4. Without praising PNoy (to avoid resistance), show them the gains of the present administration in comparison with all the previous ones thru pictures, thru figures/numbers and facts, and attribute all the gains to honest governance, not perfect but fair enough for a start. 5. If they reason out that every politician is corrupt, convince them to go for the least evil. Make them rate the candidates from 1 to 10. Least to most evil. With a rate of 1-5, there is still hope for change. A 6-10 rate is hopeless. Then show proof that binay’s rating should be 10. 6. Finally, make them realize that change begins with oneself. The Battle of The Binays has come down to WINNING THE HEARTS and MINDS of Filipinos not JURISPRUDENCE. Why is the Philippine Media not promoting Mar Roxas? Why is Philippine Media more about Grace Poe and Duterte? No more news on Trillanes caper! Where is Trillanes? Now, lookit! Trillanes wanting to be in the limelight came up with incredible news about Limlingan and the secretary of Binay they are abroad according to “unnamed sources” inside Binay camp. 2. Instead, he tapped his “unnamed sources” to make waves. This is the same Powerful Trillanes instead of going to Register of Deeds to see if the Land Title of BinayLand belongs to Binay or Tiu, forced Tiu to produced the Land Title of BinayLand. When Tiu produced an AUTHENTIC Land Title Trillanes blew his top. What he expect Tiu to present was a forged Land Title. To make more waves for Trillanes to surf the media circles HE HAD THEIR PASSPORTS RISCINDED !!! He could have done this two years ago. Weird this Trillanes. See what people would do if they are ignored by the biased Philippine Media. NEXT TIME THE MEDIA IGNORES TRILLANES, HE WILL STAND ON HIS HEAD IN PUBLIC TO CATCH ATTENTION. MRP – in the Philippines,you can exit and fly to another country using a different name, different passport; so how credible is it going to Bureau of Immigration to validate their flights? Sen, Trillanes may just be right… there’s another senate inquiry this July and let us wait for this. Junior is served by Ombudsman. Vice-Mayor Pena took his place. Violence erupted! This happened in the province of Cebu, if I remember right, it is in Mindanao area where their Mayor was served instead of vacating camped out instead in the Capitol !!! Is there really Laws and Constitutions in the Philippines? Yes, there is but nobody is really respecting it. Just like The Binays. Would just like to point out that the very premise of this topic (and the comments that followed) can be viewed as condescending to CDE. Ironic, since the angle that resonates to me most , that has been mentioned in these comments e.g. by Jameboy, is to NOT condescend to classes CDE. I assume nobody here belongs to the low income classes (if you have enough idle time to lurk or write here that means you are not a low wage earner). So why do we all assume they are stupid voters just because they are poor and pro-Binay? Viewed from a political economy lens, the CDE in fact vote rationally because they want the system upended; they want to be on top. And as somebody said previously, the AB classes have continuously fought this “disruption” ergo preserving their own place in the social and economic strata. This happened when AB took ousted Erap. The elite and the middle class could not stand having Erap, somebody not “from their class” as their president. It is similar to how some Americans cannot stand having a black president, ergo Tea Party and gridlock. BTW, nice Amorsolo painting of rice farmers to accompany this post, which I suppose is our representation here of the CDE classes? Very quaint. Please see my response to jameboy, above. If the AB class ousted Erap, do you mean the court conviction of Erap is nothing? the years of trial, the witnesses, the evidences are nothing, it;s just the elite and middle class that could not stand having Erap as their president? I don’t agree as it seems that you believe that Erap is innocent and that Erap is just a victim of class war or whatever you want to call it. FYI, Erap belongs to the AB class, it’s only rhetoric that says he belongs to the poor, much like the claim of Binay, a billionaire who is insisting that he is pro poor because he was once poor. hello mary grace, my assertion is that the 1986 people power movement was backed primarily by the “middle class”, which I will call AB here; it is the same phenomenon that happened afterwards in korea, egypt, etc. It was these same AB class Filipinos that ousted Estrada, who was legitimately elected by the people. The conviction of plunder came afterwards. Whether he was innocent or not is immaterial — it is the chronology that is my point. Would he have been ousted as quickly and as extra-judiciously if he had a good work ethic, spoke better English, and was not drinking and womanizing all the time? Estrada won with less than 40% of the vote because there were 10 candidates in 1998. Same with Arroyo in 2004. That means 60% of Filipinos voted for another candidate. Binay is going to win in similar fashion in 2016 because the Philippines has no run-off system. I just feel that is what should be discussed, not “education the CDE”. Exactly, It’s not just because he is not what the AB class preferred, its for those reasons and more as divulged in the impeachment trial and exposed in the various media write ups. Not speaking better English is not a reason he was ousted, he should not be judged by that, we are Filipinos not English speaking foreigners, we share the same problem articulating ourselves. It’s what he did and did not do. Were the people wrong in ousting him? I say no. The issue with Erap is that impeachment is a political process and because people got impatient they did not even wait for the senator judges to render judgement. This gives Erap’s supporters a sense that the rule of law is applied selectively. This has caused a rift in our society that we can only mend through a shared sense of nation and a non selective rule of law. Well, we should strive to explain to the CDE class that the rule of law was not applied selectively. I have followed the impeachment proceedings on a daily basis, I brought along with me a transistor radio to monitor the early proceedings as I hurry back from work to watch the live tv coverage so as not to miss anything. The intelligent and experienced defense lawyers of Estrada regularly harassed the prosecutors and witnesses much like the same way it was done in the ex CJ Corona trial. In the former, it became clear that the eleven senator judges will not render a fair judgement so the people took matters in their own hands. The people was vindicated by the court’s conviction, a fair trial so unlike the one done in the Senate. If the people did not act, Erap would have continued to be president and the plunder would have been greater. If the evidences have not been too strong to ignore and former CJ had not so arrogantly insulted the Senate hearing that it would have been glaringly wrong for the Senator judges to render a not guilty vote, Corona would have been still CJ today. The politicians take care of their own kind. So few are still with righteous principles, most are corrupt themselves. This repeated mantra of selective justice is getting to be tiring, mouthed by Jinggoy Estrada and the 2 other detainees, as well as Binay and his spokesmen. I say gather enough evidences and bring the rest of the alleged corrupt to court. Give additional budget to the COA, DOJ and the Ombudsman so they can do their work at our preferred timetable. Sorry Joe, is the discussion effectively hijacked? I think charles got the point I’m driving at. Mary, the ouster of Erap is different from his conviction. He was ousted illegally and convicted lawfully. We have to differentiate because they are different. I can sense that you’re coming from an emotional perspective which I think should not be the case because the issue has long been settled. What we’re just trying to do now is to formulate a theory on how we can go about engaging the CDE class in order to tilt the balance, Binay’s lead, that we consider coming from their end. Almost everybody agrees that a conversation is proper and hope that it would provide a better perspective on their part that may serve as reference for the coming days. I find no relevance on echoing the guilt or conviction of Erap before his followers. It has been settled; he did the time and has been pardoned. Ran for president; came in decent second and is now the mayor of Manila. The mentioned of Erap’s name was only to frame our understanding of the hurt feelings they’ve experienced at the time and our acknowledgment of shortcomings that has been made that caused such offended feelings. The premise of the article provokes us to think how to better engage or talk with the CDE class (the bulk of which is where Erap’s followers comes from) not about Erap but mainly about Jojo Binay and the possible risks that goes in supporting him. Ok, I respect your opinion. Is people power then wrong, am I wrong in my understanding that it is enshrined also in the 1987 constitution? Erap was ousted through that people power, and if you are saying that we were wrong, then it follows that that our framers of that particular constitution are wrong and that the people who ratified it are wrong, too? To answer your question it is necessary to frame it in the proper context of how to ‘speak’ to the CDE class because that was the idea where the ‘honest mistake’ line was made. To start with, just because something was enshrined in the constitution doesn’t mean we can just ignore and violate all other legal processes we have in our system. Just because we have the strength in number we can already assume that we can subvert the law with impunity. If that is the case, the thought of class war, the strong and the weak will really linger on in our people’s mind which I’m sure you will agree with me. Erap’s ouster created an animosity made worse when Gloria Arroyo proved that nobody can equal her in greed and want. I’ve never heard nor read anyone recognizing the emotional offense created against those people who look up to Erap and made to suffer under his predecessor who was put in power by the so-called people power. The ‘honest mistake’ angle, not necessarily the wrong, was made in acknowledgment of the offended sensibilities felt by those who supports Erap and thought he was not treated the proper way. The ‘honest mistake’ is an indirect way of expressing an understanding of other people’s feeling on the issue. It is the emotional, not the legal, part of the story that we share with them. The ‘honest mistake’ is an expression of recognition where their sentiment is coming from. I really think it is wrong to start a dialogue focusing on the ‘wrong’ aspect, on unnecessarily emphasizing an issue already settled and has not been challenged with. I’d rather we focus on those things we share understanding with them and recognize people’s sensibilities on matters that were relevant to them. I focused on being sincere and honest, and I opened my response talking about how I will not be honest and sincere if I acknowledge the mistake of ousting Erap, knowing how I feel. I have faith in our poor countrymen, that after these facts are explained to them in a calm, friendly and non accusatory manner, they will see sense. I will not insult their intelligence and their sense of right and wrong. What can I say? You are arguing an issue which is not the focal point of the subject matter. Let us say you are the expert/consultant of the panel who is tasked to reach out with the CDE class for the purpose of having an open dialogue concerning among ofher things the alarming trend regarding Binay’s favorable standing among the masses. Are you telling me you will advice your staff to start the dialogue by opening up old wounds? That they should focus on the technicality in Erap’s case and lay it the table for everyone to say his piece on the matter? That your staff’s honesty should not be bounded by decency and formality and just go ahead talk to the CDE classes and let them know that your group is brutally honest and will not hesitate to call spade a spade? If that would be your focus, you might be talking but you are not building bridges. You are not connecting. You are practically telling people that they are wrong, Erap was guilty, etc. And Marcos? Mary, I think you need to read back the article. There’s too much information in what you are saying which tends to drag the discussion in all direction. We can talk about Erap’s conviction or the technicality on his political comeback, etc. in another blog. Here I think Binay got lost in you just because you did not agree with expressing our recognition of the emotional hurt on the part of the masses about what happened with their idol. They were hurt and offended. They may be in the wrong for feeling that way but it was emotion and not criminal deed. What’s wrong in recognizing that? What’s wrong in understanding the reason why they are again backing somebody (Binay) who stood by their idol when everybody seems to be running away from him? It’s a fact and we should recognize it to be able to demonstrate sincerity our part. Again, the purpose of the ‘talk’ or dialogue is to open up the lines of communication and acknowledge the existence of certain events in the past with the purpose of reconciling and sharing views while keeping focus on the main task ahead which is the perceived locked of Binay with the masses. We are not talking with an enemy. We are not engaging in all out debate about how sincere and honest and pure our political conviction is. None of that. We are connecting and extending a hand to “talk” as suggested by the article. I’m talking to my immediate circle of influence, with positive results. Most understood me and got recruited in spreading the same. As I have said, there are many ways to do it. As for me, I will not be dishonest to myself and to them. I don’t want to be a hypocrite, not saying that you are. I cannot convince others if I don’t believe in what I am talking about. Being honest and diplomatic can be done, believe me. I’ve seen it done. That’s what I’m talking about. It’s not about you, Mary, it’s about them. It’s about their feelings and thoughts in what happened in the past about Erap and FPJ the effect of which we are now seeing in Jojo Binay and Grace Poe. I am trying to understand your viewpoint. Do you consider affirmative action as condescending to african americans? Hello Gian, no I dont. Are you equating “educating the CDE classes” with affirmative action? I dont see the connection. My viewpoint is that you cannot assume AB is smarter and CDE are just “bobotantes”, if I am using that word right. You cannot change the mind of a Binay supporter — it is not a matter of education; it is a matter of personal background and belief. somewhat. The CDE may not be slaves but they are slaves in the economic and societal sense. Affirmative action is justified by stating the systemic oppression that African Americans/Native American Indians have suffered and how it has caused a setback in terms of economic/social well being. As for my views I believe that the whole strata of Philippine Society needs to be educated. The AB crowd fails more if we factor in the average education and opportunities that they are given and how little they appreciate the fact that rampant inequality is not sustainable. When society is too unjust then it will eventually reach a boiling point that will sweep away their privilege. If the Philippine Elite do not become good citizens more than good business people they ran the risk of being in the wrong side of history when what you term as people getting angry and no longer allowing this sh!t to happen. I’ve on occasion referred to the BBL as similar to American affirmative action laws. It accepts reasonable favoritism toward the disenfranchised group to make up for past neglect. In that sense, the laboring poor in the Philippines . . . who have been disenfranchised, no matter what nice words are spoken . . . earn special treatment, like state-built housing. In the context of this blog, that addresses Angle 1, the candidate’s promise of something more than roads. It is revealing that some of the anti BBL sentiments read like statements against affirmative action. PS: To BBL opponents read up on some SCOTUS dissenting opinions on Affirmative action because it will make you sound less like I do not like new things. I fear the unknown so I am opposed. Politicians get hold of lower classes because of lack of education. Presidents should pour more money on education so the poor will be able to redeem itself out of the clutches of any greedy politician..and also there should be a law banning religious leaders making endorsements, cause members really do follow their leaders. Yes, I agree. The CCT program addresses that, as implemented in our province, it’s being monitored on a regular basis, if a child dropped out of school, he gets dropped in the program as well, same when he (and the other children of school age) and the mother fail to show up in the health center for the regular check and nutrition support. Strict implementation and compliance assure a continuous program coverage. The maximum ages of the covered students are raised, too for more coverage. Education and health is the twin target. We aim for healthy mothers and students so they can uplift their standard of living. Our barrio school is one of the only 3 schools chosen in the whole of our city to have free K-12 free education, other barrios will have to commute to ours to avail of them. TESDA school branches were opened and supported by the provincial and city governments in cooperation with the national one. Small and medium sized loans are being offered as well, to be renewed once fully paid for livelihood programs like sari sari stores and RTW clothes making. Those who avail got enrolled also in health insurance which is an excellent bonus knowing that medical and health problems in the rural areas are constant sources of worry and stress. People love stories, and a good narrative is a powerful tool in the hands of an expert campaign manager. I would submit that in the last presidential election Aquino won almost by virtue of narrative alone. Scion of heroes, uncorrupted by politics. The Philippines looked back to the shining moment when it was the star of the democratic world via People Power and handed him the Presidency on a silver platter. Too bad he’s intellectually lazy and hasn’t done much of anything in his entire tenure of public service (we obviously differ of opinion on the President, but let’s leave that aside for now). Of course narrative isn’t everything, since the Villar and his Rags to Riches story were only good enough to place him third in the elections, but then perhaps that’s because he and Estrada split the non-Aquino votes. In the upcoming elections only one candidate has a sellable narrative. Daughter of a man “cheated” of the presidency by GMA. She is beloved by progressives for her thoughtful stance of the issues, whilst her last name (if used properly) can win over the masa who fondly remember her father. Nobody has a better narrative than Grace Poe. I can imagine the campaign ads now, starting with footage of FPJ’s campaign, newspaper clippings of his loss and eventual death, then fade to black. Cut to Grace Poe kneeling at her father’s grave. she stands up slowly and turns around, the camera slowly zooming in. Her face is resolute, she raises her fist and yells “Tatapusin ko ang laban ng tatay ko!” (I will finish my father’s fight!). As she turns around the camera rotates with her and behind her are thousands of people from different stratas of society. If this was well made, it wouldn’t matter who your candidate was, you would be in tears by the end of the ad and begging to vote for her right at that very second. Binay won the VP role last time around because of shrewd politicking. I doubt his message of “Ganyan kami sa Makati” has much hold outside of Imperial Manila. It didn’t help that Roxas was a little lazy, assuming that the Pnoy narrative would anoint him as well (he was almost right). If we take as a given that the LP and UNA have equal strength in terms of political machinery, then the candidate with the better story will win. And that candidate is Grace Poe. I should say that I’m not entirely pro-Poe, and that I’m merely assessing her as having the most captivating, emotional (this is key, Filipinos are an emotional lot, even me!) narrative. So the break-through to the DCE audience is “go with Poe”, because she has that special popular appeal, something that cannot be manufactured, no matter how many angles one speaks at. I certainly think that is true and I’d go with that, except I think she is rather not what she projects, lacks comprehension about many things, and possesses that peculiar arrogance of self assurance that will allow her to do stupid things in office. But we’ll never get perfection, I think she is not monetarily dishonest, and will do a lot of good with the stupid. Like most presidents. I just hope her stupids are not, like, going with China and against the US, as Santiago is inclined to do. We should discuss President Aquino some time. I view him as intellectually active but having his own peculiar arrogance of self assurance. But at least he has the knowledge of government operations to back it up. Joe, I rarely visit but my Google Now led me here after your topic caught my attention. Kudos to you for focusing on what I consider the very root of why the Philippines has been saddled with incompetent and dishonest political leaders for the last couple of generations.Binay is just the latest incarnation of the problem. It is a very controversial issue and rarely discussed publicly because those who do are often times accused as being biased with an elitist or bourgeoise mentality. But until this problem is addressed and significantly more effort and resources are focused on voter awareness and education, we and our children will be cursed with this predicament at barangay and national elections again and again. I appreciate the visit, Caliphman, and your observation awakened in me the understanding that learning to speak to (which should start with listen to, as readers have observed) the CDE class is not just something to be applied to the defeat of Binay, but the ending of the disenfranchisement of a huge population by the economically powerfully but compassion deficient. Thanks for the awakening. I have to say I admire the unerring intuitions of your good heart. You, Yvonne, Chit, Cha, Filipino-Mom and Pelang are some of the names that come to mind when I think of the counterparts that reflect the moral compass and integrity of Conchita Carpio-Morales in this and Raissa’s blogsites. Thank you, Edgar… Coming from you who is so full of wisdom is truly a great compliment. I seldom see your comments in raissa’s blog, but I enjoy your wit and wisdom here. Take care, please. You are so right about our the others and our Ombudsman and I salute them, too.. Bless you, Ombudsman Morales for your moral compass and your fighting words re the mob rule of Binays’ supporters at Makati. Where do we draw the line between extreme tolerance and discipline/order against total disrespect of authority?. I literary cringed at the sight of those plastic chairs flying towards the direction of our police officers who can’t do anything but cover themselves against those flying chairs? I had even seen one who repeatedly hit the hapless officers using a chair. And the VP had the gall to confront the leader of the police group! IS CHAIR THROWING AN ANCIENT CULTURAL TRAIT OF MAKATI RESIDENTS? MAKATI CITY, Philippines – July 1, 2015. The recent news report on the standoff between the national government and the local government of Makati City under Mayor Jun-jun Binay highlighted the use of plastic chairs not only for seating but as weapons to be hurled like rocks or bottles. Meanwhile, political observers noted that chair throwing seems to be a cultural trait of Makati City residents. Sociologist/historian Antonio Contrary notes that the Tagalog word for chair, “salumpuwit” had its roots in ancient Malay civilization and its early settlers in the Makati marshland. “Sinasalo nito ang puwit pero kapag ibinato mo, lumilipad ang puwit kapag may nakaupo! ” What Makati natives realized is that when you throw chairs, you are sending the message that you cannot sit here anymore, ” said Contrary. It’s similar to throwing shoes in the Arab world. Laughing out loud here…. a lot of chairs have been thrown by the assholes… ooops…sorry. They destroyed a lot of salumpwet… how will they take care of their asses for the duration of their vigil for their benefactor… ahhh maybe they have a family corporation supplying mono block chairs for the entire Makati. Watching the news today, something occurred to me: a few months ago, before Bong Revilla was arrested, there was also a lot of buzz about his supporters camping out in Cavite expressing their love for him and how they will stick by him. But after he was taken away, nothing. It’s like his “supporters”, waking up the day after and finding they could live without him after all, decided to move on. It would be interesting to see what happens with the Binays’ most vocal supporters now, especially since Kid Pena (I call him Mayor McCheese since he replaced the one who “allegedly” supplied free Chickenjoy) not only promised to retain all the residents’ perks but will even try to double them, for which he was applauded. So, are they die-hard fans? Or were they simply protecting their interests, preserving their status quo? This thing about paying the crowds to attend events …. as a foreigner, at first I could’nt believe such a thing. Then I hear this all to often. Then I read somewhere an article where the writer said he went to QC city hall (or some official building) where VP Binay was supposed to appear and address something, the writer noticed there was someone recording attendees’ name. There was no apparent reason to record names of those who turn up, other then for handing out the rewards later. I think most were purchased fans and will just go home. No allegiance to the issue at all. What will be interesting is how Pena will deal with department heads loyal to Binay, and who have vowed not to listen to Pena. I hope he has some disciplinary powers. Round up all the vids, soundbites, media publications of the following incidents, make an infomercial of it (explanations unnecessary) and run loops of it anywhere u can. 3. VP Binay 1986 closing down of Makati YMCA clubhouse — his kids were not allowed to swim because they were no accompanied by a club member. 4. VP Binay poking his finger at Supt Elmer Jamais and Binay bodyguards manhandling cops. 5. Junjun Binay’s wang wang –The youtube video of Junjun Binay’s convoy caught in Cebu. 6. Are there anymore out there? Corruption, $ and pesos, all these have no impact on CDE. Bullying sure does. There you go. That would likely do the trick. Do a saturation blast right before the election. Have a print version done, too. This is what happens to Filipinos when they are on the pedestal of power. The lose their memories who they are. They get alzheimer. And the Filipino bodyguards becomes little JJ and Jejo by extension. It is cultural. It is not colonial. Because the Mestizo Class will never hire bodyshields that are arrogant. What I am saying, COLONIAL MENTALITY IS GOOD!!! Because the left-over colonists are never involved in shenanigans and corruption. If only Filipino brains were colonized by the Mestizo Class they’d be honest like the Mestizos. Lookit those pro-Binay people massing against the authorities. They do not look like they are educated. I just wonder what made them think The Binay Crime Family is innocent. ugh….KMU supports Jun Jun Binay…. Mami Kawada Lover, now we know these left leaning groups will be one of the groups who will campaign for Binay. The key to the problem of how to break the Binay lock on the CDE class has been discovered. And it was Binay himself who found and implemented the solution: the B rosary. This sacrilegious artifact — a black rosary with the letter “B” embedded in the center of an equal-armed cross — should prove to the CDEs that Binay has absolutely no compunction to use and desecrate the country’s main religion for his personal ambitions. In effect, Binay has equated himself to The Savior. Perpetuate the solution, inundate the countryside with the rosary’s image and the twitter messages of Niko Dave and others, and B will descend to his rightful place.